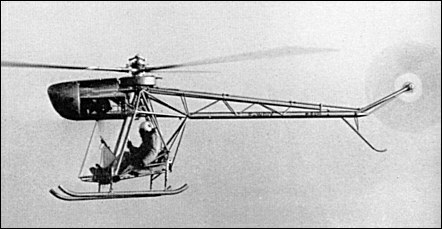 The Matra company produced for a young engineer, Paul Cantinieau, a helicopter designed by the latter and differing from most other such aircraft by its weight distribution. 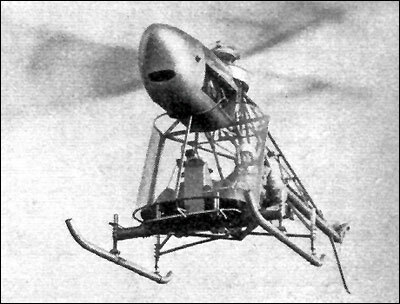 The engine, set horizontally towards the fore-part and well above the cockpit, is placed in close proximity to the rotor. The only disadvantage of this theoretically admirable arrangement for stabilizing the helicopter is that the pilot's upward visibility tends to be reduced. The rotor exhibits the following unusual features: it consists of a universal hub mounted on a constant velocity joint with the result that all primary napping is eliminated. Throughout their entire length the blades are untwisted and their thickness chord ratio is low. Furthermore, the relative position of the engine and motor produces a reduction in the amplitude of transmission vibrations. 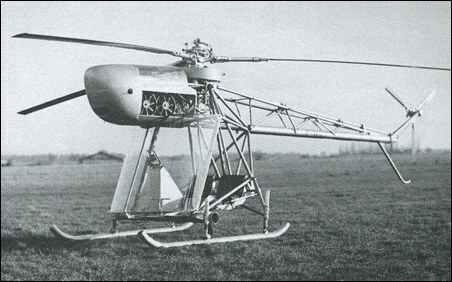 This helicopter, known as the MC.101, made its first flight with great success on 11th November 1952, and has since flown admirably, but none the less failed to find any market in France. Cantinieau therefore developed his ideas further on behalf of the Spanish firm Aerotecnica. There the MC.101 became the AC.11, to be followed later by the AC.12 and AC.13, the latter powered by a gas-turbine engine. Throughout their entire length the blades are untwisted and their thickness chord ratio is low. Furthermore, the relative position of the engine and motor produces a reduction in the amplitude of transmission vibrations.